As our cities become increasingly denser, the available area for living outside, whether it be public or private open space, becomes more precious. We are surrounded by more and more concrete, glass and steel. Ground level green space is also being lost as a consequence of medium and high density developments. Governments try to counter this through their planning regulations which often dictate that developments provide a required amount of ground level open space. However, overall the result is a nett reduction in green space in our cities. The planning regulations also try to improve the quality of our urban spaces by mandating a stepping back of buildings from the street frontages. This can contribute to improved streetscapes, but results in a reduction of lettable floor area as the levels go up. People are intrinsically predisposed to surround themselves with living plants. Biophilia is a well-studied phenomenon that has been demonstrated to improve human well-being. 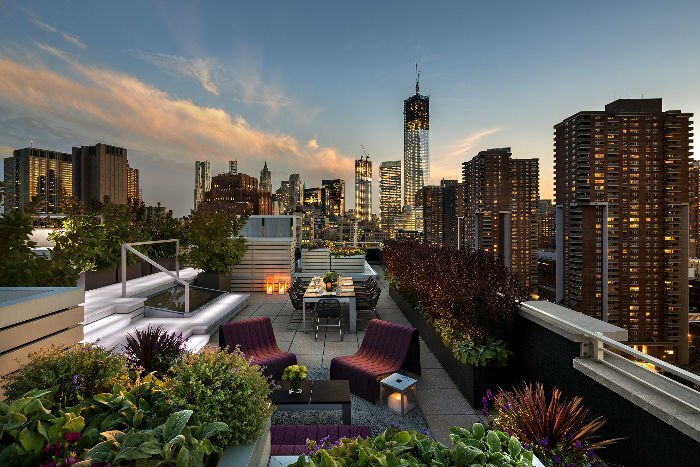 When people move into a new development, they often express this desire by cramming in as many pot plants as they can to fill their outdoor terrace spaces. This is not only the case for many multi-storey residential developments. There is also a growing trend towards including greenery throughout new commercial workplaces and retail spaces. Unfortunately, unless the building owner and/or tenants are committed to tending these sky gardens, the plants invariably die. Like some on-ground landscapes, greenery at height that is ad hoc and not integrated into the form and fabric of the urban environment, if it is reliant on manual irrigation, is unlikely to survive in the medium to long term, especially given the harsh California weather. All too often the living green is replaced with dead brown and the pots eventually get removed. But what if the development was to integrate these features into the project from the beginning? 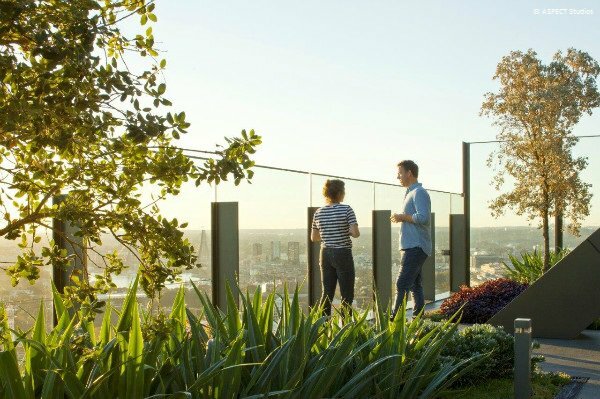 Rather than being an afterthought, the terrace garden could be an integral part of the living space. Much like the best of all good architectural design, integration of indoor and outdoor space is possible at height. The roof terraces resulting from the planning scheme set back requirement, rather than being windblown, hot and hard paved spaces, could be lush garden rooms that increase the property value. Rather than having a barren balcony terrace around the lunchroom-kitchen of an office development that no one ever visits, it could be a soft and comfortable space that gets used every day. Creating these living green spaces need not be difficult or expensive and provided they are designed well and integrated into the overall project, they will be relatively low maintenance. As more and more of these projects are successfully realised, the technology and methods of establishing greenery at height improve to ensure success. The greenery, as well as increasing property value, also provides many other benefits. Some of these are tangible, such as the reduced temperatures caused by the shading and evapotranspiration effects of plants. Living systems also contribute to management of storm water by retaining water on site and removing contaminants. Other advantages are less tangible, such as mental health benefits of being close to plants. At Farm Urbana we help provide urban farming to rooftops, making these living green spaces valuable in keeping local grown food reachable to tenants and the community. Most food is shipped from miles away across the country, and that creates transportation, storage, energy and pollution problems; by having communities grow their own food locally, they are consuming fresher more nutritious produce. Farm Urbana is about providing the freshest fruits and vegetables while raising awareness for lifelong health and wellness, inspiring, and educating people to create economically sustainable neighborhoods.